Stamps Fans! Head down to any Calgary area 7-Eleven store this season and take advantage of discounted tickets for any 2018 regular season home game. This 7Rewards special member only offer saves you 17-35% off the gate price of tickets. That’s a savings of $8.11 for regular home games and $18.11 for premium games. PLUS 7Rewards members receive 5000 bonus points that can be redeemed for FREE food and beverages, including Slurpee. Tickets must be purchased in store in pairs only when scanning 7Rewards registered membership. Text Stamps to 711247 or visit 7Rewards.ca to download or register 7Rewards today. +Offer cannot be combined with any other coupons or discount. Text STAMPS to 711247 to download 7Rewards app. 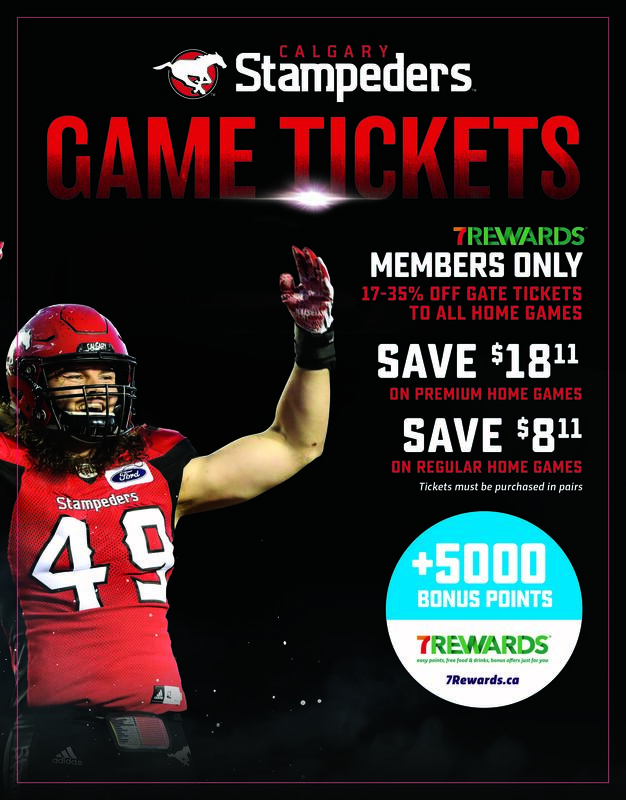 Buy two (2) Calgary Stampeder tickets at a participating Calgary and area 7-Eleven store. 7Rewards app must be scanned with the purchase of tickets to obtain discount and 7Rewards points. Check the email account associated to the 7Rewards app to get your Ticketmaster code to select your game, based on availability. Must be opted in to receive email codes to avoid possible transmission delay of Ticketmaster codes. Go to the account section of the app and select email notifications to confirm you are opted in to receive email. Any issues with ticket delivery please contact customerservice@stampeders.com. 7Rewards app is not available on all devices.